Sen. Evan Bayh (D-Indiana) announced today that he would not seek reelection — just days before Indiana’s Friday deadline for the 4,500 signatures required for candidacy in the race. R.J. Gerard, communications director for the Indiana Democratic Party confirmed to TPMDC that the state Democratic Party would be able to select a new candidate to run in November’s general election if no one files petitions with 4,500 signatures (500 within each of the state’s nine House districts) to run in the primary. So the state Democratic Party is going to pick the candidate for November’s general election. Bayh had been leading in the polls against his Republican challenger, Dan Coats, by a healthy 20-point margin, and Bayh’s exit means that will probably be largely forfeit. It remains to be seen what Democrats across the country have learned from Scott Brown’s unexpected victory in Massachusetts. It seemed clear last week that sitting Iranian president Mahmoud Ahmadinejad had a tenuous, at best, hold on popular opinion in the run-up to Iran’s presidential elections. Iran’s huge urban youth population overwhelmingly supported a moderate reformer, Mir Hossein Moussavi, who had promised more personal freedom for Iranians and more outreach to the rest of the world. When the results came in Friday, they showed that Ahmadinejad had won handily — prompting immediate cries of fraud in Tehran and around the rest of the world. 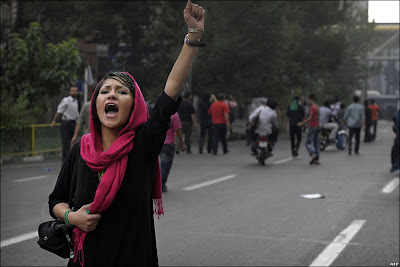 Iranians took to the streets in protest, despite a government ban. Rioters faced police squads equipped with tear gas and clubs; photos and YouTube videos linked to by Twitter users have shown people, including women, being savagely beaten by riot police. They’re still out there now — in Tehran, perhaps more than a million have gathered in the city’s “Freedom Square,” and reports of at least one fatal shooting are emerging from the protest, now more than 72 hours since it began. This is going on now, so details are difficult to sort out. Christopher Hitchens, who has spent some time writing about Iran and its leaders, cautions not to call what happened in Tehran an election in his Slate.com column. Real-time images posted via PicFog. Update: Boston.com has a hi-res series of some of the most stirring images from the ongoing protest. Some are graphic.